Since 2001, the Apartheid Museum in Johannesburg has been the world’s leading authority on the events of the 20th century in South Africa. Part of the Gold Reef City entertainment complex, the museum offers an emotional insight into the period of state-sanctioned racism and segregation that lasted from 1948 to 1994. It documents the struggle of the South African people to overcome apartheid and illustrates how the country is attempting to work towards a brighter future. For anyone with an interest in South African history, it is one of Johannesburg’s must-visit attractions. The museum comprises 22 individual exhibition areas, all of which use a combination of artifacts, photographs, film footage and information panels to document the rise and fall of apartheid and to give visitors an idea of what it was like to live in South Africa at the time. It also hosts regular temporary exhibitions including (at the time of writing) one dedicated to the life of Nelson Mandela. The museum experience begins at the entrance, where guests are arbitrarily divided into “whites” and “non-whites” and made to enter through separate doors—giving a powerful taste of a time when people were grouped into four racial categories and treated accordingly. Once inside, exhibitions include “Apartheid,” “The Turn to Violence,” “The Homelands” and “The Truth and Reconciliation Commission.” The first explores the social and political factors that led to the creation of the apartheid regime and features a list of apartheid laws as well as photographs of the forced relocations that took place under the Group Areas Act of 1950. “The Turn to Violence” documents the ANC and the PAC’s decision to form underground armed wings in the wake of the Sharpeville Massacre in 1960. Several exhibitions feature the powerful photographs of Ernest Cole, a black photojournalist who was eventually forced into exile. The Apartheid Museum is also home to a small-scale replica of the Nelson Mandela sculpture located at the museum-affiliated Capture Site in KwaZulu-Natal. The original sculpture was erected in 2012 on the roadside between Nottingham Road and Howick, at the site where Mandela was arrested in 1962. This historic date was the former president’s last day of freedom before beginning 27 years of imprisonment (first at Constitution Hill and later at Robben Island). Created by sculptor Marco Cianfanelli, both the original sculpture and the replica at the Apartheid Museum consist of 50 poles that line up at a certain point to create an image of Mandela’s face. Intended to promote the idea that the many make the whole, the sculptures celebrate Mandela as the iconic representation of all who suffered under apartheid. 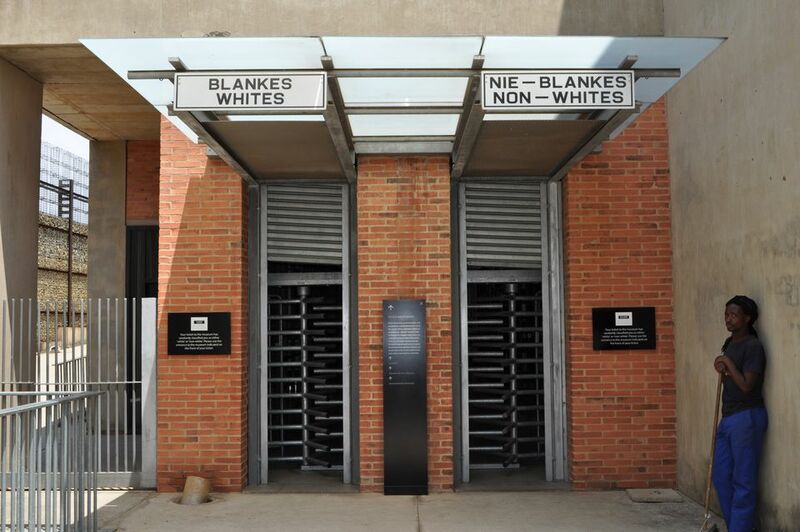 The Apartheid Museum is part of Gold Reef City and can be found on the corner of Northern Parkway and Gold Reef Road in Ormonde, Johannesburg. It is open every day from 9:00 a.m. to 5:00 p.m., with the exception of Good Friday, Christmas Day and New Year’s Day. The website recommends allocating at least two hours for your visit. Guided tours are available for groups of 15 or more (except on Mondays) and must be booked in advance. Admission costs 95 rand ($6) for adults, 80 rand for pensioners, university students and children, and 40 rand for school learners. If you book a guided tour, there’s an additional fee of 10 rand per person. If you want to extend your visit, there’s plenty to see and do near the Apartheid Museum. Gold Reef City is Johannesburg’s premier entertainment destination with a theme park, casino, two theaters and a movie complex. History buffs will particularly appreciate the park’s underground mine tour, which explores Johannesburg’s heritage as a mining town founded in the frenzy that followed the discovery of gold in the Transvaal in 1886. The complex has two hotels (Gold Reef City Theme Park Hotel and Southern Sun Gold Reef City), making it easy to turn your Apartheid Museum visit into an overnight excursion. The museum is also close to several apartheid-era landmarks, including Constitution Hill, the former prison and military fort that once incarcerated Nelson Mandela as well as other resistance leaders including Joe Slovo, Robert Sobukwe and Albert Luthuli. Nearby Soweto township is also deeply rooted in apartheid history. Soweto Guided Tours offers a Soweto & Apartheid itinerary that combines a visit to the Apartheid Museum with a tour of Soweto that includes stops at Vilakazi Street, Mandela House Museum and the Hector Pietersen Museum. Vilakazi is the only street in the world to have housed two Nobel Prize winners (Nelson Mandela and Desmond Tutu).